If you would like to talk to someone on Facebook, you will need to allow access to microphone. We are going to tell you how to do this here. There are two different situations while you are allowing access to microphone. One of those situation is your first time visit, the other one is about if you have already blocked access from Facebook. You can find solutions for both situations below. 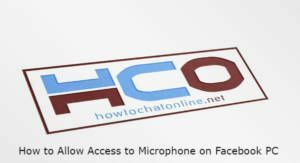 How to Allow Access to Blocked Microphone on Facebook – Unblock it! You will see two different scenario below. You will need to allow access to microphone when you are using new browser (or device) or you need to allow access when you already blocked access. You can find how to unblock access on Facebook below and how to use Facebook voice call. Open the chat of your friend who you want to talk with voice call. Tap on voice call icon. If it is your first time with the app, allow all access to your microphone on browser. Click on green Secure text in the address bar of your browser. You will see that camera and microphone are blocked. Select Allow from the selection just near of camera and microphone. That’s how you can allow access to microphone and unblock it. If you have any questions regarding this issue, you can feel free to ask us.